My sister gave me a gift card for Starbucks for my birthday. 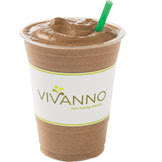 So on my way home from school this afternoon I decided to try a Vivanno Smoothie. I chose the Banana Chocolate, as I am a sucker for banana's and chocolate- YUM! The picture below is from the Starbucks website. It was delicious. Turned out to be 5 points total, but that includes an entire banana, so you're also getting a serving of fruit out of that! I didn't realize this when I ordered, but if you go with non-fat milk, you could reduce the points to 4. To quote the website, the smoothie is, "Freshly prepared with a whole banana, bittersweet cocoa, 2% milk and our own proprietary whey protein & fiber powder and ice." While drinking it, I was reminded of a slim fast. It was like a slim fast mixed with a banana. After I saw the ingredients, it all makes sense! This is a great healthy option for something sweet yet healthy when you're on the go. I'd probably buy it again, but wouldn't make a special trip for it. I haven't tried one of these yet, but I have thought about it LOL!